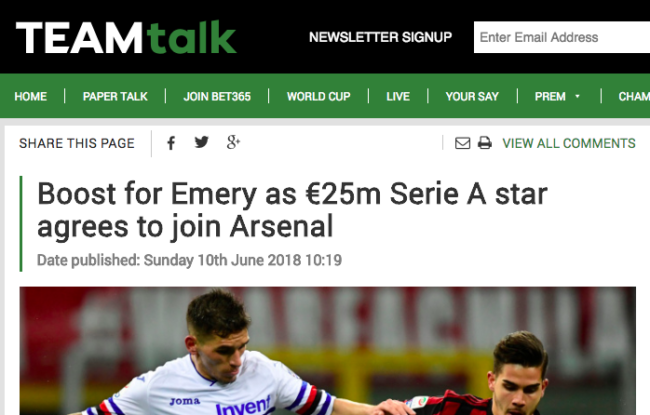 In what TeamTalk calls a “boost” for Unai Emery, a “€25m Serie A star” Lucas Torreira has “agrees” to transfer to Arsenal. Teamtalk says Lucas Torreira’s arrival jeopardises Granit Xhaka’s Arsenal future. Why Arsenal would replace a man who likes playing higher up the pitch with a defensive midfielder is moot. Another site says Torreira will replace Elneny. The Mirror says: “Why Lucas Torreira can be Arsenal’s very own N’Golo Kante.” Presumably because like the Chelsea harasser, The Uruguayan is short. In other news away from Torreira being as good as three players and goo enough to constitute the entire Arsenal midfield: no deal has been done. And in other Arsenal transfer news, Portuguese newspaper A Bola says Arsenal “insist” on signing Sporting winger Gelson Martins. Gelson, we read, if willing to buy out his own contract in order to secure his transfer to Arsenal, who have offered €30m for the winger.